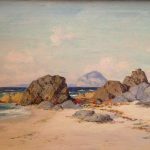 An accomplished Scottish artist in oil and watercolours. Son of artist John McNicol 1862-1940. The last of the family of Glasgow art dealers. His works have been exhibited at the Royal Scottish Academy; Royal Scottish Society of Painters in Watercolours; Royal Glasgow Institute of Fine Arts.